I feel like I’m stuck in a bit of a blogging rut lately. I’m baking as much as ever and I having a ton of fun learning to use the fancy new camera Santa brought me for Christmas. (I was a very good girl last year!) But for some reason, when I sit down to write about what I baked I draw a blank. Bloggy writer’s block…who knew? Tonight I decided it was time to break out of the rut. Is there a better way to do that than by sharing donuts? I think not. These are not just any donuts. These donuts are full of tropical flavors. 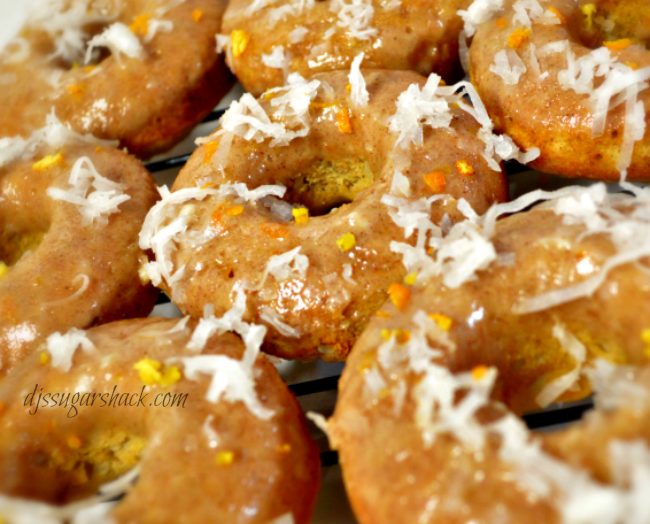 How can you resist a donut full of coconut, banana & orange? Well, you just cant. 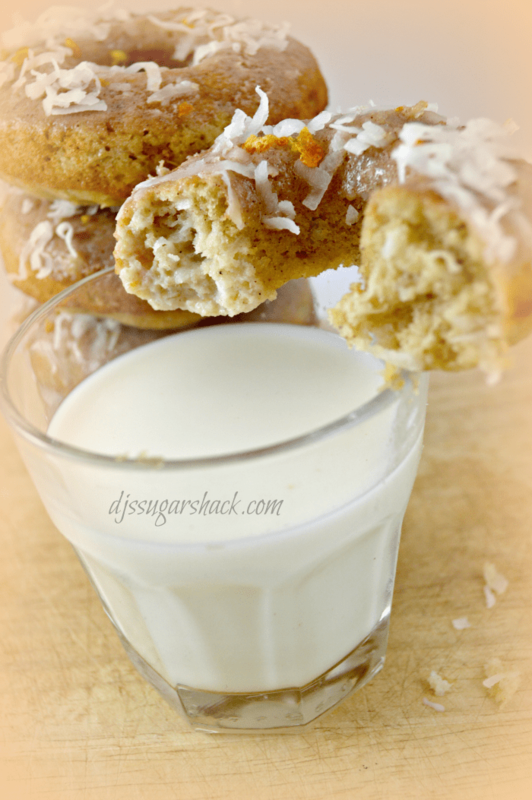 The orange coconut vanilla cream cheese glaze is to-die-for. I only wish that I had used more on these donuts. 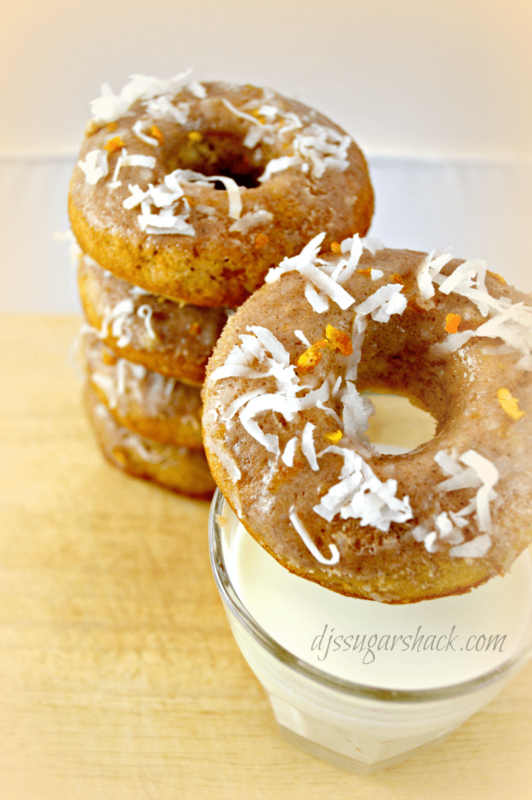 Easy to make baked donuts with excellent tropical flavors. In a large microwave-safe bowl, combine mashed banana and butter. Microwave for about 20 second. Once butter starts to melt stir to combine. Add orange zest, sugar, brown sugar, cinnamon, buttermilk, egg, and vanilla. Stir until just combined. Add the shredded cocnut, baking powder, and flour.Stir until just combined. Spoon batter into donut pan Bake 15 to 18 minutes. Let cool in pan for about 5 minutes. In a shallow bowl combine orange zest, powdered sugar, cream cheese, vanilla extract cinnamon & shredded coconut. Slowly whisk in heavy cream until you get the consistency you desire.